3 bunches of Calla Lilies (cut 10 inches including the bloom). This is a variation of the contemporary bubble bowl theme. We saw in recent posts how to make a single bubble bowl arrangement, then a double bubble bowl and now a triple. 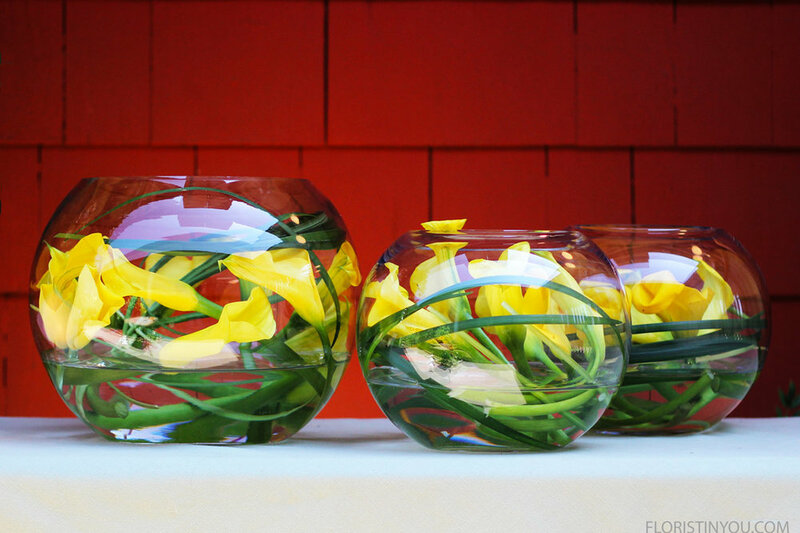 Each bowl in this arrangement uses one bunch of yellow Calla Lilies and 4 or 5 blades of Lily Grass. Calla Lilies are in vogue right now. They are from the genus Zantedeschia and the Araceae family. The name for Calla Lily in Greek means beauty, and yellow Calla Lilies symbolize gratitude. Lily Grass is used to create exotic lines in modern flower arrangements. The blades of Lily Grass are about 30 inches long and 3/8 inch wide. 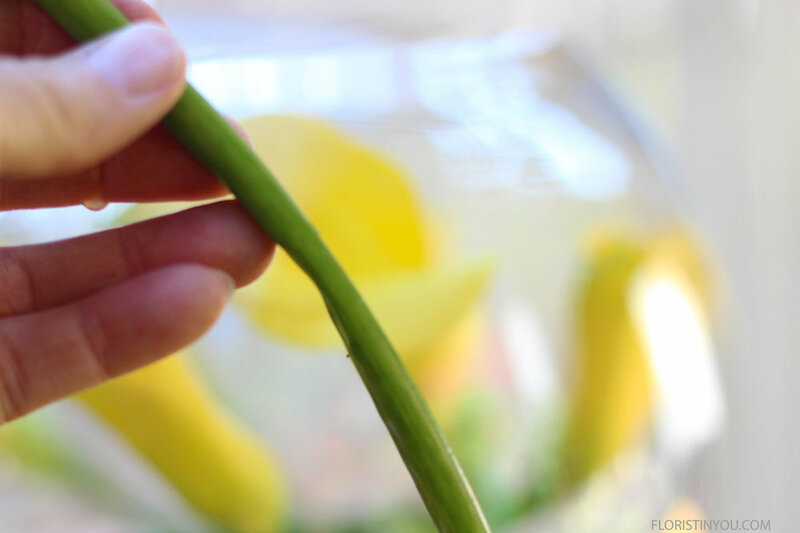 Tip: Don't leave the Calla Lily stems too long. Cut them about 10 inches long including the bloom and gently put the stem in first and then lay it around the bowl. You will need two 8 inch Diam. bubble bowls and one 12 inch Diam. bubble bowl. You can buy the 8 inch Diam. bubble bowls like this (click here). And you can buy a 12 inch Diam. bubble bowl like this (click here). You can stack the bowls or have a grouping of different sizes on a table. Bubble bowl arrangements in person kind of have an optical illusion. 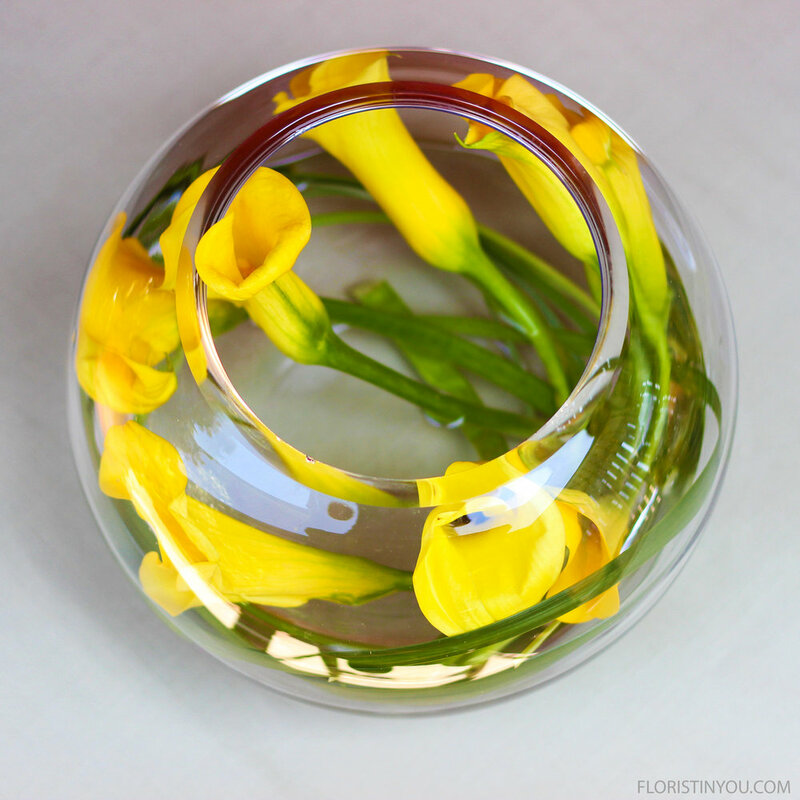 The round shape of the glass enlarges the size of the flowers. 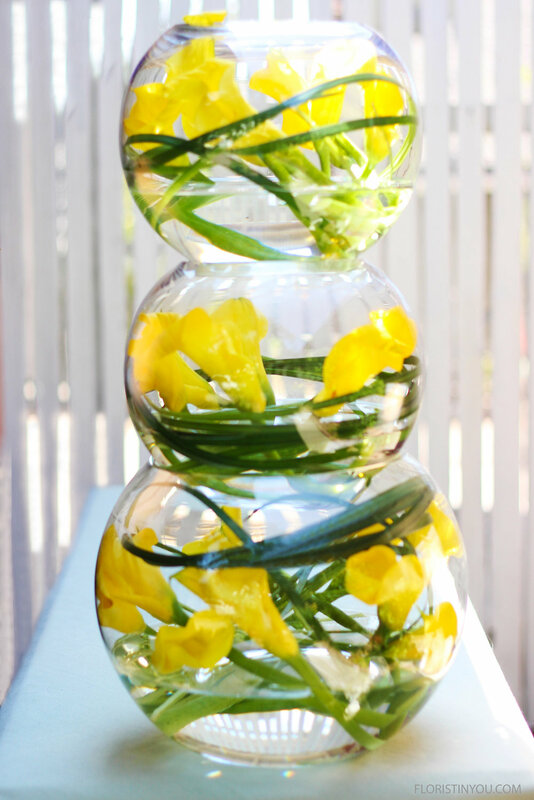 If you have your bubble bowls, Calla Lilies and Lily Grass you are ready for this quick and elegant arrangement that has a very artistic flare to it. Let's begin. Put stem in first and gently wrap around bowl. If one bends cut it about 8 inches and stand it upright in the bowl. Take 4 or 5 blades of grass. Give a fresh cut. Stagger the ends and lay around the bowl. 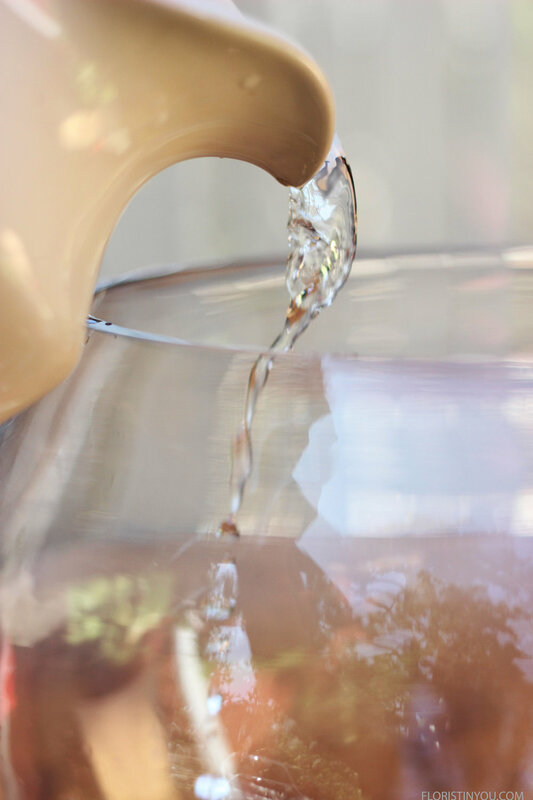 Pour water in 2nd bowl and carefully stack it. Give grass a fresh cut. Stagger ends and lay around the bowl. Repeat the process for the third bowl and you are done. You can display them stacked our grouped next to each other.